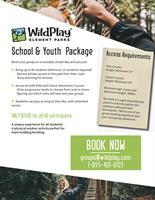 Season passes on sale offering unlimited adventure course activities. Climb, zip and swing through the forest getting exercise and thrill all in one location at the lowest rate possible. New this year is the Kids Course only pass for only $99.99. Use the Try'N'Buy in park for even more savings. New group rate for school groups. Private rental, unlimited access.